I went out to the field last Friday, Saturday, and Sunday (1-3 April) for a full weekend of flight training with two different instructors. On Friday, the conditions were too turbulent to perform the maneuvers that I needed to practice, so I didn't fly. I got practice running wings and ground handling, but I'm still rather clumsy at that right now. It was pretty cool to see standing lenticular clouds (lennies) along I-66 on the drive in, but none appeared around the airport. 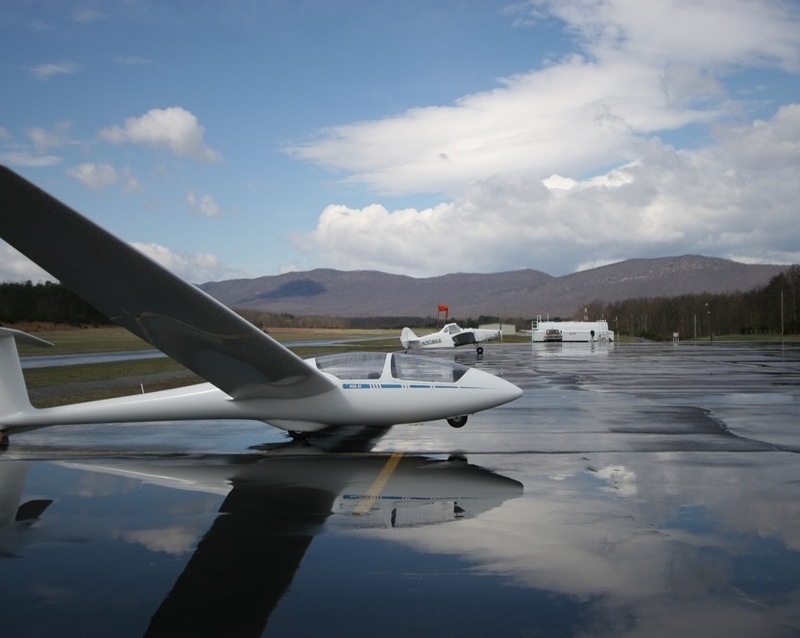 These clouds indicate that the conditions may be right for mountain wave soaring, but that didn't pan out. The wind direction was 300 degrees at about 20 knots, which is also usually good for ridge soaring, but there was no lift to be found. On Saturday, I got three flights in despite a rain/sleet cell that passed through the area. The precipitation off in the distance, some of which was snow, was wild to see aloft. It was a privilege to fly with this instructor. He gave me insight into finding thermals and how to core them. He demonstrated speed-to-fly, which if done properly, requires quick changes in airspeed when passing into and out of rapidly sinking air. He also taught me rapid descent spirals, where full spoilers are deployed and steep turns are used to load up the wings to increase the descent rate. My air work (steep turns, etc.) was deemed solo-worthy. My tow flying skills, on the other hand, were rubbish. I did a lousy job of keeping in position behind the tow plane, and though I knew not to, I wanted to use aileron vice rudder to recover from excursions, resulting in overshoots. And I didn't keep my wings level relative to the tow plane's: I held a persistent roll error of a few degrees for some inexplicable reason. Just prior to releasing the tow rope on the first flight, I inadvertently climbed relative to the tow plane which put tension on the rope. After release, the rope tied itself into a big knot, and the tow pilot had to land with 100 feet of it trailing behind. This is not a good way to make friends with tow pilots. Turbulence and a mild rotor developed off of the ridge as the day went on. Flying the tow was even more difficult as we plowed through that rotor, experiencing brief periods of 2000 fpm lift. Since the conditions were no longer conducive to training, my CFI demonstrated a low-level simulated rope break, cleverly referred to as "PT3" for Premature Termination of The Tow. After taking off and reaching 300 feet AGL, he released the tow rope and made a steep 180 degree turn (an "impossible turn" in a Cessna 172). He deployed full air brakes and landed downwind with a 15 knot tailwind. 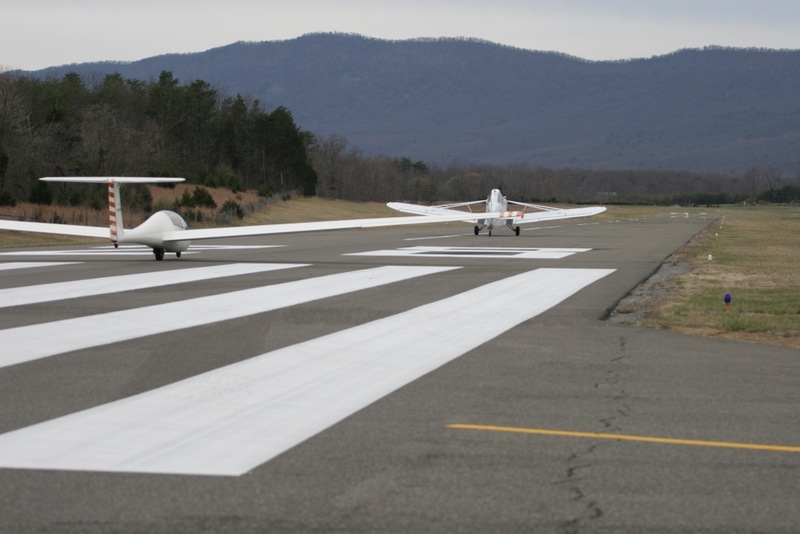 The glider was stopped well within the first third of the runway. Amazing. The demonstration made it clear that there is no time to ponder and deliberate if the rope breaks that low to the ground; you must have a plan established ahead of time and react immediately. On Sunday, I flew with another instructor (the 4th so far). We practiced thermal flying techniques with good thermals to work in the morning. I made my first landing on grass, using the strip between the taxiway and runway. A few pilots reported that they had made it into mountain wave (one got a 5 hour flight out of it), so we took a tow to 4000 feet to try to get in it. That didn't work out, but the thermal activity was still good. This instructor helped identify a tendency of mine to skid into turns and caught me neglecting my scan. All good stuff to work on. The CFI showed me how to judge my altitude on the downwind and base legs using the angle and movement of the runway numbers relative to the horizon. I have this down on final approach, but I had never tried it on other legs of the pattern. I made two passable landings with no reference to the altimeter (he had me scramble the pressure setting to render it useless). I set up high on the last approach and performed a forward slip with full air brakes. These gliders can make a much steeper approach than a C172. I had a blast this weekend, and I am grateful to be able to fly with the instructors in this club.